Dawn Raiding is a term Percy and I used to describe our fishing exploits. We were always out fishing at dawn, summer or winter we would get up to some crazy things all above board! It was our mutual love of nature that meant we experienced many a dawn chorus or seeing a fox make its way back to its hiding place, coming face to face with a deer on the tow path on the Cam – all sorts of things that most people don’t see. This is the story of our last dawn raid together. But first... I must have been 11 or 12 when I first met Percy outside his shop in Newmarket Road waiting to go on a trip with a load of other kids. It was at a time when you would get 200 Peg Open Matches on the Cam and Ouse every weekend and there would always be a junior angling section in these matches, so us kids often got to go along. Percy and his brothers had taken the match scene by storm having learnt the art of fishing the castor with his “friends from up North”. The Anderson brothers and their close-angling friends called themselves the ‘Pimpernels’. 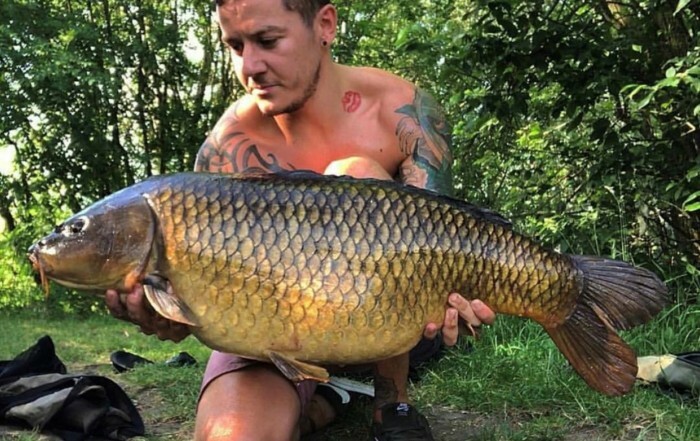 They won so much coin they often had to turn up late at the draw because if they were seen in the queue other anglers would not go into the pools. As a lad I was expected to help out and prepare the bait for the older ones. There would be two or three of us having to do this early on Sunday mornings while Percy and his chums sat eating breakfast. I would often see Ivan Marks and Eddy Allen in Percy’s front room waiting to go off to a match on the Cam or Ouse. Sometimes we were lucky and got to go to the match otherwise it was a half a pint of maggots and fish the Cam! My life so far has been heavily influenced by what I consider a single-minded but caring character. In more recent times as well as referring to me as a son Percy called me the “poet”, a reference to writing that I had published as a kid. Still we referred to him as ‘Codshead’ so I guess we are even. It was Percy that first persuaded me at 15 years to go on to the CFPAS Ltd Committee, then to be Secretary and then finally as President of this great club. He has helped me through some difficult times! He would not usually say much, something like “You have broad shoulders son, you can carry the burden”. He knew I found it hard to speak at public occasions but still he pushed me forward. He also knew that I give great thought to things, trying to ensure I did right. We occasionally crossed swords, usually on angling administration matters, something Percy had little time for. This world of rules and regulations is not for the likes of Percy, he hated it. I have spent many hours in his company but only just recently received his approval. Apparently apart from one or two little points I might make a half decent angler! Talk to many of his other friends and you will inevitably get a different take about their relationship. I know for instance that throughout his life my friend Ian Darler has had his ear clipped on many an occasion even up until the last Club Match! Percy and I were very close but sort of on the basis, “You all right” “Yes I’m alright” we had an instinctive form of communication. Percy would in the main tell me what to do! Some people are also saying that they have ended up with a variation of Percy speak! You know saying the wrong words and so I guess there will be Tweed speak now that he has gone. 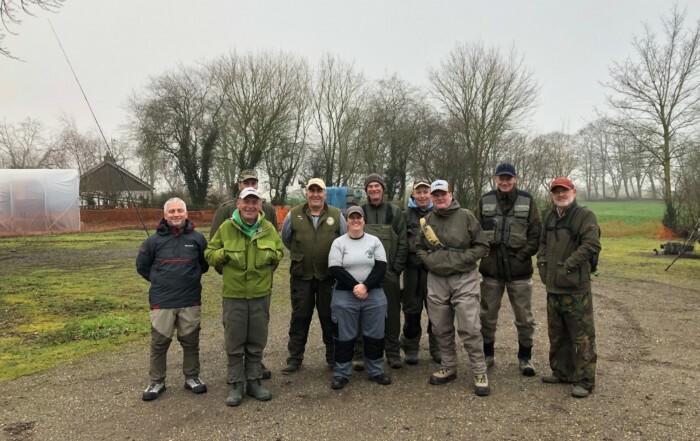 On and off over the years we have fished together however over the past ten years this has not been the case as we kind of drifted apart on the angling front. Percy preferring to fish all day on Sundays whereas I preferred to be home for lunch. I had also drifted away from actually fishing preferring to visit all our waters on a Sunday bailiffing for the Club. All this changed this last year or so with my attendances at our Club matches. I know this was something Percy was pleased to see and despite some health issues he attempted to come along to them until the cold weather prevented him from fishing. So it was to be one of our Club matches that he and I would re-kindle our fishing experiences as we drew pegs side by side in our Club match on the River Lark in October. His face was a picture when he leaned out of the window of Dave Cooper’s van and shouted to me “Where you drawn son?” he bellowed. “12 Percy”, I replied. A quiet moment as Percy realised he had drawn next to me then, out of the van he sprang, it was almost that this discovery had given him renewed vigor for here we were going to fish together again. The Lark flood bank is very steep yet he endeavored to make his way to his peg without our help. A proud and strong man. I held out my hand and he clasped it firmly as I pulled him up to the top. He whispered to me that he hated needing this help. I just said, “I know, don’t worry Percy” he held my hand for a moment longer. It was rough with all the years of fishing and doing the many things he had done. It was late October and the mist was still rising from the river. The bank was sodden as we tackled up and covered with those dewy cobwebs. The river had a tinge of colour and good flow following mid-week rains. There was very little wind, which is quite unusual for the Fen; the sun was quite strong making for a lovely warm Autumn day. I knew Percy loved the sun on his back. I could see the glint in his eye; Percy was going to enjoy the day. Not because he wanted to beat me off the next peg but because we were going to fish side by side once more. There was an extra edge, the tutor/pupil thing. 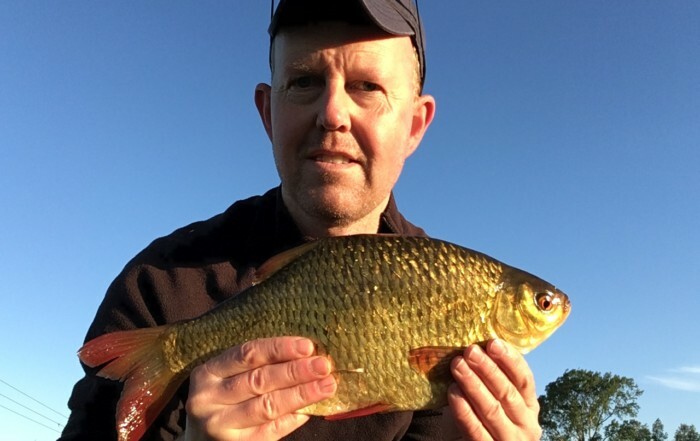 He even started his spoof antics – by pretending to tackle up with different tackle but I knew he would fish the waggler and in turn I decided to do the same. Throughout the match, I kept getting the sideways look, and then he would pretend not to be looking. It was all part of him trying to ‘psych’ me out. He of course knew I would not be taken in; it was just a game he played and was clearly enjoying it. I would get the shin din bit as well, where I would call up to him and he would ignore me. The first 1½ hours of the match just flew by. I tried to keep up but continually fell back as Percy snared a better stamp of Roach to myself. I was positioned in the peg above Percy with the river flowing right to left. Every effort of concentration was going into his fishing. He was indeed relishing the challenge and it was truly a magnificent demonstration of waggler fishing that I was witnessing. I kept plugging away but felt I was always behind and just hoped he would tire. The odd word would be exchanged between us; Percy continued to pretend to kid me. I in turn would try and sneak a few fish into my net without him seeing and then I would net one or two to try and kid him. They were not big fish. Silly little things that we have always done when we have fished together. Roach, Rudd and the occasional Perch made their way into our nets. A Kingfisher whizzed by, and I shouted up “Did you see that?” Of course he did as he shared the same love of the natural environment as myself. Percy kept a true line as we went into the last hour of the match; the number of fish going into our nets became less frequent. We were enjoying the company and the lovely warm weather. We had become oblivious to the others that were fishing the match, in fact it was an irrelevance, the day had become all about he and I and our thoughts on past trips. I found myself reflecting on these memories but at the same time I did not want to have a duff catch so I kept plugging on. I had been fishing a shorter line than Percy and so decided to go further out and fish the far bank. This change resulted in an instant response and I was then into catching Rudd on a more regular basis. Slowly I started to peg back on Percy and I would see him turning his head to check my catch out. Yes, there was a competitive edge between us but it was just friendly rivalry and as the final whistle went I felt quite honored to have been in his company. At the whistle the sun started to recede behind the flood bank. Percy returned his catch. After weighing in neither of us had bothered much at the scales. We knew we had come nowhere in the match but we also knew that we had appreciated fishing together which to us was equal to winning. It was quite an overwhelming experience, a day to cherish. I make no excuse over the sentimental nature of this story because I hope it sums up all that is good about our sport. This was our last dawn raid and probably the most memorable of them all, a day filled with sunshine and laughter. The only thing that was missing was his little dog Jimmy. Some years ago when I used to go around with Percy on what we called our Dawn Raider, Percy would do us a pack-up. I would always get a call on Thursday evenings, on the lines of: Percy “Well son where do you fancy going fishing this Sunday?” “Well Percy I hear the Hundred Foot is fishing well”. “No, mate, the River lark, that’s where we are going!” “OK Percy” why he ever bothered to ask me I just don’t know but hey he, as he would on occasion point out, is the ‘Elder Statesman’. So it was off to the Lark and yes, whilst I was up at dawn it was not until 7am that we finally got off to the river from his house! To be fair Percy had made some bacon sarnies and wrapped them neatly in tin foil and so I had them to look forward to later in the day. I had this fear that one day we would return to his home and find it burnt down. You see his electric oven had somehow had its knobs burnt and Percy had to turn on the hobs with a pair of pinchers. To have a cup of tea you had to put a butchers weight on the ‘ON, knob of the kettle to keep it down. I never understood why or how the items got broken especially as they were relatively new. Anyhow we got to the River lark on a blowy September morning, the river was stationary and gin clear you could see the bottom from Prickwillow Bridge. Now this should have been the signal for us to go to the Hundred Foot and fish in the tidal where we would find colour in the water but no. The Lark was the place to fish. Two hours later I had two small Roach and a Perch. The boredom was only briefly interrupted by a visit form Percy’s little dog Jimmy who would every now and then come shuffling along to see me wagging his tail and making this little snuffling sound. He would climb all over my tackle, break pole rigs and generally make a nuisance of himself and then bugger off back to Percy. Enough was enough, the lure of those bacon butties was too much and so I negotiated my way through the stingers and those horrible plants that leave millions of little sticky balls on your clothes. “Come for some grub son” Percy said, “Yes, Percy, I have only caught three fish!” “Oh well son, here you are” Percy handed me this huge package. Jimmy got excited, as he would always get fed some of the bacon. “I made em this morning with top back bacon!” (Best back) I’ve got this new bread made in Australia, its loovelly”, it’s called ‘Mighty Bright’” (mighty white) its sort of half brown, half white”. “Sounds good to me Percy”, I replied. Percy never skimped on the ingredients. The butties had three huge bits of bacon in them and were doused with copious amounts of tomato sauce, I like mine with brown, but I always got the red stuff! Mighty white bread had sort of brown flecks in it, so as I bit into one I did not notice anything untoward. Anyhow as I stood by Percy chomping on my sandwich I tasted something not to my liking. I immediately spat it out with bits flying into the river just next to where Percy was fishing. Percy was quite startled by this and a little offended. “Look here son, that’s not very nice, I went to a lot of trouble in making them and you should be grateful!” “I am Percy”, I replied, “its just that they taste funny” “what are you on about?” mines fine, Percy gulping down another bite. “Look Percy” I opened up one of the sandwiches to reveal large amounts of blue/green mould. “Look Percy they are mouldy”, now Percy did not take kindly to this statement and was just about to sound off with some choice words when he saw the extent of the mould. “I can’t understand it, I got the bread out fresh to day. Give it here son. Percy picked out the bacon with his maggot-stained fingers and handed the bacon to me, he threw the bread to the ducks and carried on fishing. Nice! I know many of you have met with our friend Percy and so if you have a funny story or event where Percy has been along then please do let us know.